So we had another date night last night (thank you, Ilse!!!) & saw Sherlock Holmes: the New One. I have no idea what its subtitle actually is but when did people stop just calling things Crap 2 or whatever? Anyway, I thoroughly enjoyed what I saw of it. To be fair I saw most of it before I fell asleep. It's a long movie - 2 hours & 4 minutes apparently. And also to be fair, the Erina Hoyts theatre now has an Xtreme Screen theatre. I don't know what that means - there were no snowboarders or BMX bikers jumping around so I'm not sure what was so Xtreme about it. What I do know is that there were extremely comfortable brand new leather seats, still stinky new. I settled in a little too comfortably & ended up drifting off several times throughout the last hour of the movie - every time I came back to consciousness I thought "Oh, that's okay it's just more fighting/action" but those are probably just the scenes that woke me up - I'm sure I snoozed through the witty repartee & the scene where Holmes & Watson finally just get it over with & make out. Will have to watch it again one day. Today was a new day as they often are. 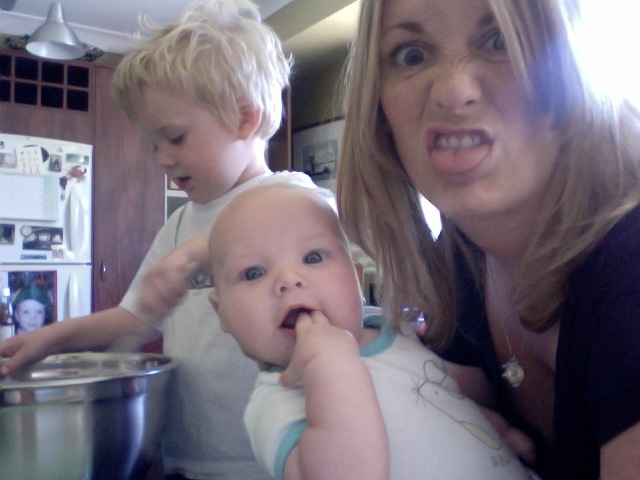 Ilse is in Sydney & Marcel is back to work so this is my first day alone with my sons in a few weeks. Scary stuff. They have been incredibly kind, I must admit. Evan has gone so far as to take TWO actual naps of about an hour each instead of his usual catnaps on me, which come to an abrupt end when I have to get up or, ya know, move a muscle. Yes, it's always that chaotic in our kitchen. And yes, lots of Depeche Mode gets listened to while we cook so there are frequent dance breaks. Notice Ben is doing the dishes. I think we all know that by the time he figures out what he's doing, he won't be interested anymore. We have a professional photographer visiting us & this is the only family picture we have to show for it. Apologies for exposing my bosom but Evan is very impatient if he doesn't eat on demand. And no, the car was not in motion - I'm not THAT bad of a mom. Anyhoo, have a happy day wherever you are.